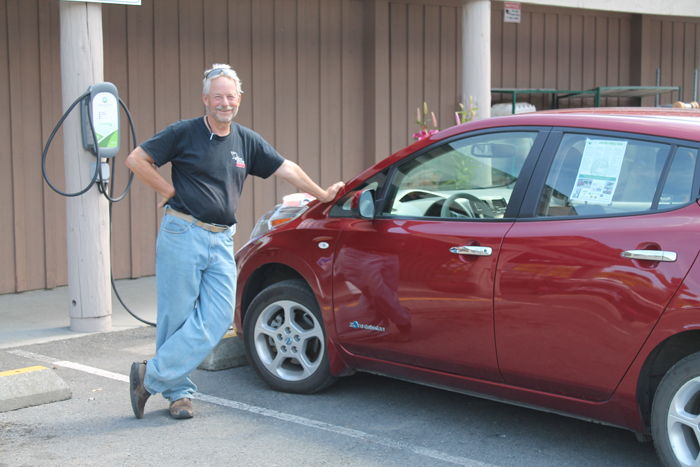 REVolutionSS coordinator Jim Standen and an EV at one of the Country Grocer EV chargers. If you see Jim at the festival, say hi to him. He's friendly! As announced in the Driftwood on March 28, REVolutionSS will be happening at the Farmers’ Institute from June 22 to 24 and you are invited to join us. The family-friendly event features the latest in electric vehicles (with test drives), e-bike technology, solar, water catchment, drones and electric tools. It also includes a demonstration of the new St. Mary Lake water treatment system and anaerobic digestion and a variety of composting options. There will be panel discussions with industry leaders, talks and many ways for you to ask your questions about our energy-efficient future. For the younger set we will have Nature Art and Pico-Energy kits and CyberScorpions team members from GISS will give demonstrations of their award-winning robot. Saanich-Gulf Islands MP Elizabeth May will open the event at 4:15 p.m. on Friday, arriving in a Tesla Model 3. Live music from local musicians takes place on the newly rebuilt Farmers’ Institute outdoor stage from 7 to 10 p.m., featuring Yael Wand with Alan Wardroper followed by SALT and Soul Shakedown. Food and refreshments are available on site. Among unique vehicles is a running 1912 Detroit from our friends at VEVA in Vancouver, and neighbourhood electric vehicles from EV Island. Salt Spring Photography Club members have been out there capturing local vehicles for their exhibition, and a heritage EV poster exhibit will be displayed. Other topics range from “Improving EV Literacy in School Children” to “Trends in Sustainable Investing” to real-world experience with Tesla Powerwall. You are encouraged to come up with your own curiosity, sign up for a location, let some other folks join you and talk it up. We are trying to send a message that electric cars are here and here to stay. To that end our off-island EV visitors are requested to come from their ferries and park on the lower field of the Farmers’ Institute. We are inviting our 165 Salt Spring EV owners to please enter via Tin Can Alley between 3 and 3:15 p.m. and slowly and carefully park their EV. Volunteers will be there to assist. Local drone company InDro will be filming the EV mash-up. Visitors in their EVs will be coming from the U.S., across Western Canada and Vancouver Island. Prizes gathered by the Salt Spring Chamber of Commerce will be given for the EV and the Tesla that has driven from the furthest distance away. There is also a picnic basket adventure and contest sponsored by the Chamber of Commerce and Country Grocer. A weekend pass costs $20 (and it’s $15 if you don’t come till Saturday). This includes entertainment Saturday evening. Just showing up for the drone footage on Friday is free. There is no charge for gate entry on Sunday. Kids get in free. We have a favour to ask of Salt Spring EV owners. We are requesting that our 10 free public chargers be allocated for the exclusive use of our REVolutionSS visitors for the weekend. This includes the latest one at the golf course, with the ribbon cutting to take place at Transition Salt Spring’s Green Drinks at 5 p.m. on Thursday, June 21. Event volunteers are requested to come to Penny’s on the Green at 4 p.m. for instructions. Please come and join us for this exciting event.